Ideal Practice for Medical or Veterinary Students. It provides professional practice tools for students learning suturing and stapling techniques and surgeons who are enhancing their skills. 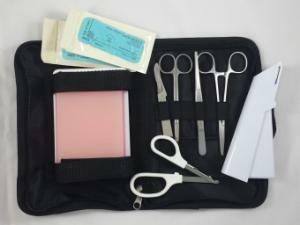 The convenient storage and carrying case makes it easy to practice suturing and stapling techniques almost anywhere. The kit contains a medical stapler, staple remover, needle holder, forceps, stitching scissors, disposable scalpel, sutures, and a suturing skin pad all tucked away in a zippered case. Caution: This kit is for training purposes only and is not for use on humans or animals.